The world’s largest electronic waste dump _ PCB recycling machine,cable wire recycling machine,E-waste recycling plant,precious metal refining machine system,E-waste shredder,plastic and metal recycling production line,copper electrolysis system-Zhengzhou Zhengyang Machinery Equipment Co.,Ltd. Countries around the world, especially developed countries, consume large amounts of electronic products every year. Although most countries have recovery technology, but in many cases, the elimination of electronics will become e-waste exported to less developed countries, such as Africa Accra, Ghana, Agbogbloshie. Because the cost is much lower than the cost of recycling in their own country. 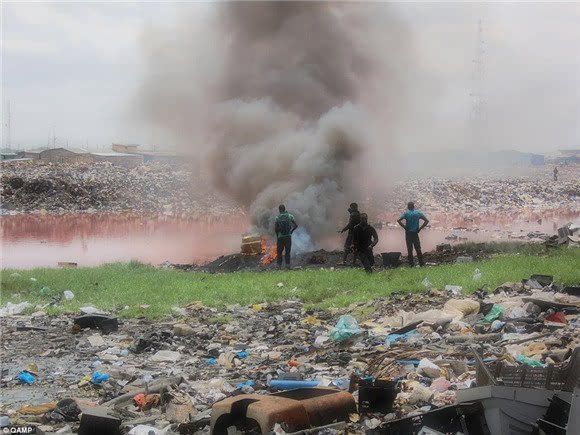 Ghana, Agbogbloshie is the world famous electronic garbage dumps, is also one of the world’s most polluted locations. Every year, many old TV sets, computers, microwave and refrigerator all illegal export processing here. These toxic substances released by the electronic waste water polluted, as life crisis. The United Nations University (United Nations University), according to a study published in 2014, the world produced 41 million tons of e-waste, was worth more than 34 billion pounds (about 317.5 billion yuan), of which only 6 million tons were normal. Last year, Europe alone produces 11.6 million tons of e-waste, the British production 1.5 million tons, second only to Germany, Europe’s largest electronic waste contributors. Although only produced 1.9 million tons of e-waste throughout Africa, but the west of the continent is becoming “a graveyard for electronic waste”. Abercrombie incineration of waste electronic products, every day in clear plastic, get a small amount can be recycled and sold in the metal. Even leakage of waste household appliances and some toxic elements, such as lead and mercury, making the area pollution is more and more serious. To the most electronic waste from the European countries in Africa. Although the old electronic products shipped to Africa is illegal, but many firms take advantage of loopholes, such as the product standard for the reusable products. E-waste recycling plant supplier：http://www.pcbrecyclingmachine.com/,All rights reserved, if you want to reprint, please specify the source.